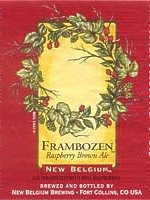 One of my favourite beers from New Belgium is their Frambozen, a brown ale brewed with fresh raspberries. Released in the fall, the amount brewed is often determined by how well the raspberry crop did this season. There was a bad crop a few years ago and Frambozen was hard to come by that fall. Pours a deep garnet colour as the smell of sweet raspberries and yeast fills the air. The head disappears quickly though, taking away some of those wonderful aromas. The fruit definitely comes through in the flavour, but is kept from being overwhelming. A little sweet up front, but finishes dry with some tartness. Makes a wonderful dessert beer, but I enjoy it anytime. Speaking of which, you need to pick this one up soon as it typically disappears from the shelf rather quickly. I'm not a huge fan of NB or raspberry beers, but I'll probably have to get this one. If it's anything like Dogfish Head's Fort it'll be good. Or if it at least has something close to the 18% ABV that Fort has, I'll suffer through even if I don't like it. Any idea of where to find it in Houston? Most of the Spec's stores should still have some. I found it at my regular Spec's location at Westheimer and Kirkwood. Its about $12 a sixpack.